With the release of Windows 10, Microsoft has released a new default browser called Microsoft Edge. In the previous Operating Systems, Internet Explorer was the Internet browser from Microsoft. Internet Explorer has been replaced with Edge. The new Edge is more secure and faster than Internet Explorer. This leads us to an irony that Internet Explorer is still available for Windows 10 while Edge is not available for older Operating Systems like Windows8/8.1 or Windows 7. It is specific to Windows 10. This situation is really frustrating, especially for the developers. But there is a way to overcome this situation and install Edge browser on Windows 8.1 or Windows 7 without upgrading to Windows 10. Microsoft has released Virtual Machine images for Hyper-V, VMWare, and Virtualbox which come with pre-installed Windows 10. 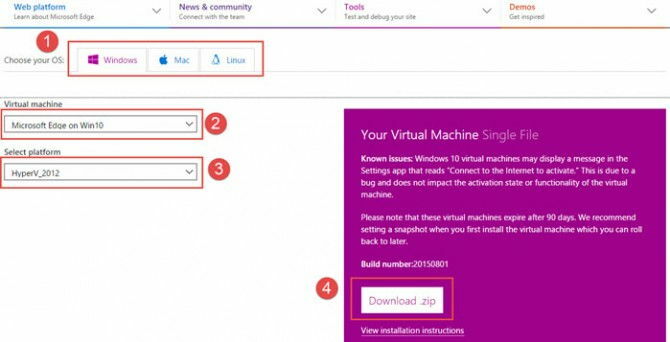 You can run the virtual machine image for free which Windows 10 will come pre-configured for you. The VM has a Windows 10 Enterprise edition with 90 days trial period. The period can be extended to 180 days which is about 6 months. Please note that if you have data saved in the virtual machine, you will lose data after Windows expire. So you should always keep your data backed up from the Virtual Machine. You can keep an extra copy of the Virtual Machine image and run it when one trial has expired. This will give you another 90 days of free usage of Windows 10 and Microsoft Edge browser. According to Microsoft, the company is focusing Edge for Windows 10 and will only release a standalone version of the browser if everything goes smoothly. But this can be a long while or never. But interested users can always try and test Microsoft Edge without compromising on Windows upgrade. Select the virtualization platform from platform drop-down. You can select from Virtualbox, Vagrant, VMWare, or Parallels for Mac. Please update the original article, the link does not work anymore. Thanks a lot Kurt, I have updated the link. This is a money making scheme to get people to buy Windows 10. I have had occasion where Edge would not allow me to copy information into my home work for school. To be able to copy my work i had to reinstall the Explorer to do so. 10 is not so great,Ive used it its best for Microsoft because I can run a new install of 7 any time and not lose anything,Theres less that users can do with 10 because Microsoft put their settings in that I can change on 7,if 10 is so great why is 7ult. still around 300 bucks.Greedy Microsoft is why.Go Apple with no problems.PC notebook starting 500 to ?? Like its 1995 again. Is this another way to force Windows users to Upgrade to Windows 10? I guess I will not be using Edge on my home computer and so will many other users. Yes definitely Microsoft is pushing users to upgrade to Windows 10 latest version. The latest version is more secure and efficient in terms of usability. The only thing that I can think of when using Windows 7 or Windows 8.1 instead of upgrading to Windows 10 is the hardware limitation. Otherwise, it should almost always be clear that people should be using the latest version of Windows 10. Windows 10 is definitely a better technology than its predecessors including Windows 7. Microsoft also offered free upgrade to Windows 10 if you were using Windows 7 or Windows 8. I think one should move on to the latest technologies instead of sticking to the one you’re used to. This is the most un-thought-out response that is asinine to state. Win 10 is NOT a “better technology” by any means. It’s not less secure and 10 is meant to generate constant revenue only and give complete authoritative control to MS so don’t spew nonsense. 10 is the worst OS made ever, even worse than Vista. Has no business in corporate environment. I’m a network architect surrounded by this……..When I speak, you should listen! How can you run a real life browser in a virtual machine ? The speed is not the same ! A Firefox or Chrome on the real system will be faster than a virtual machine with Edge ! The solution is not an option. Also, Windows XP can run a virtual Windows 10 machine, sow we can use Edge on Windows XP ! Dissapointed ! Microsoft OS is a big failure ! “If bill gates wouldn’t have locked the market down by burying the best ever designed operating system under tremendous amounts of copyrights and such then our systems would have been much safer and much faster and more stable then anyone could imagine. I’m talking about the one and only true OS that is capable of handling any kind of hardware. They never should have let microsoft be in charge of any OS since their one and only purpose is to exploit the world as their personal money machine. I myself see Bill Gates as a kind of digital Adolf Hitler because he drains the economy worldwide undoubtingly causing real deaths due to the nature of power in this era. They succeeded to get rid of the RAM limitation (although not by changing the source but by adding own assembly language) but the orignal DOS was never decoded up to today. (remember that in those days it was common to make an executable (non-decoable) after te programmer finished his work in order to protect his own labour. The extension used at that time was .COM (which is still being used by windows. The first file the BIOS looked for was COMMAND.COM (which is in essence the heart of DOS) if the BIOS could not find the file it would return an ERROR stating “Disk Operating System not found (DOS !) and you couldn’t use your system untill you inserted a disk with a COMMAND.COM file. Thus resulting in an OS that was build like a russian doll. (shell around a shell and embedded in a shell) which caused the infamous screens-of-death and still does ! I’m still convinced that if they would put their efforts in developing a brand new DOS orientated OS we could make a giant leap into the future. In short : our hardware is still running on ancient technology in it’s core and loads of shells are used to prevent our systems to crash due to a reset of the BIOS instruction counter. Science should be ashamed that after 30 years they still can’t figure out how to create a functional BIOS and OS. Todays Linux variants proofs that our system’s performance can be enhanced a lot but still the beating heart is out-of-date…. I’m sorry that i didn’t took the time to explain the real technical properties of both BIOS and OS but it would simply be too much and probably too difficult for most people. So students if you want to be famous just create new smart BIOS or even find a way to get rid of the BIOS since it’s the real bottleneck in every computer system. e.i. : The main task of the BIOS is to check if all hardware works correctly by checking RAM, Keyboard, Display, Disks etc. Yet due to it’s ancient nature no BIOS is capable of detecting any mouse or USB connected device, which proofs that it’s really ancient and not just a made up story. Pff im done now, dunno why i actually wrote this since nobody will probable understand or even read it. Very interesting read. Thanks for sharing. DOS was certainly a great Operating System which paved the way for modern OS but technology always moves forward and if we site at one place thinking of the limitations of the technology we’re using then we’ll never be able to achieve the next step in technology. DOS paved the way for Windows, BIOS paved the way for UEFI etc. I hope you understand this..
Can you write in English? How do you run a chicken on an egg? Easy, put the chicken back inside the egg and then eat the egg. You’d be a chicken not to swallow the egg. In this case the chicken preceded the egg. It does, click run, type iexplore and it will come up. ie isn’t the standard shortcut. iexplore works on all Windows OS.